While visiting the Atlanta area, the Silver Comet Trail is a MUST ride for any cyclist. The Silver Comet Trail is a converted Rails-to-trails ride. 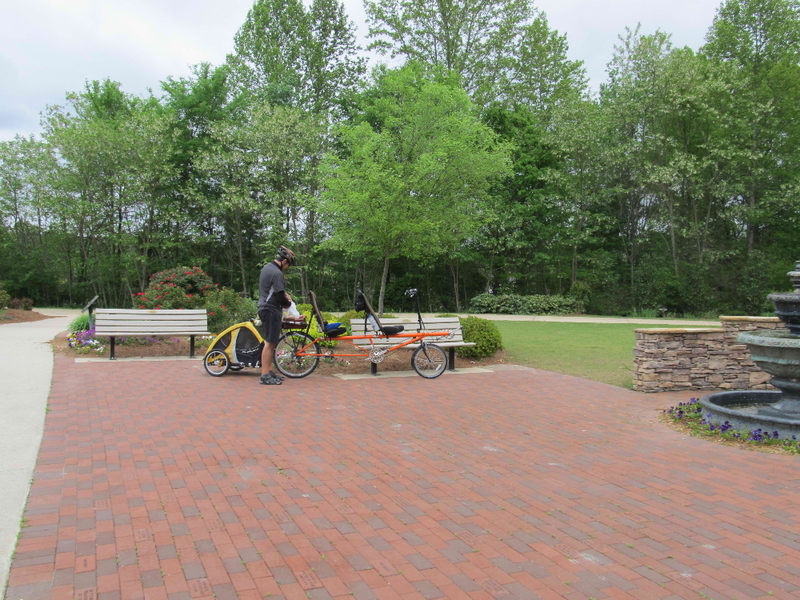 We started at the Floyd Road parking lot about 4 miles from the start of the trail in Syrma, Ga. The trail runs 61 miles, all the way to the Alabama-Georgia State line. There it connects with the Chief Ladiga Trail. This connection forms a trail which will go from Atlanta, GA, to Anniston, AL, or a distance of about ninety (90) miles. This trail is in the Rails to Trails hall of fame, and it belongs at the top, on our lists of rails-to-trails. We spent the night in the Walmart parking lot, about a half mile from the trail. According to our iPhone app, your allowed to stay overnight at this Walmart. But we like to check. So I went inside and tracked down the assistant manager and asked permission. He informed me that I need to ask the security officer who rides in a white small pickup truck, keeping things in order in the parking lot. After flagging her down, I asked if it was ok to park overnight in the parking lot. She said I was to ask the manager inside of Walmart. I kept my mouth shut, feeling that my diligence was complete, and all had a restful night. It was an overcast day, with temperatures only reaching the upper 60s. The trail was in GREAT shape, and well used. We rode westward for 24 miles, with Sammie in tow, before making a U-turn and heading back easterly to the parking lot. There are many little admiral facilities as you ride, until you get past the Rambo parking area . . . then things get a little remote. The Silver Comet is mostly tree lined, but there are so many spring flowering shrubs and trees, birds, bridges, and parks to hold you interest. We did not see very many wild animals, a couple of bunnies was all. After our U-turn, and we think we were in the town of Dallas, we stopped at Aubrey's restaurant. It is down a hill and across a major route. It was, by far, one of the worst meals we have had cycling. Period. Everything was either fried or taken directly out a tin can, and warmed up. The soda dispenser didn't work correctly, the portions were small (thank goodness for little favors). But the most interesting aspect of this dining experience was that Aubrey's was very busy! It is a sin not to be able to eat well on a long cycle ride, after all food is why we ride! Again, come and enjoy the Silver Comet Trail?but find a different place to eat! Brrrrrrr . . . .
People reading this blog in Toronto will be saying "Big Deal", but 16 degrees last night and only 45 degrees during this bike ride (in Florida) is cold! 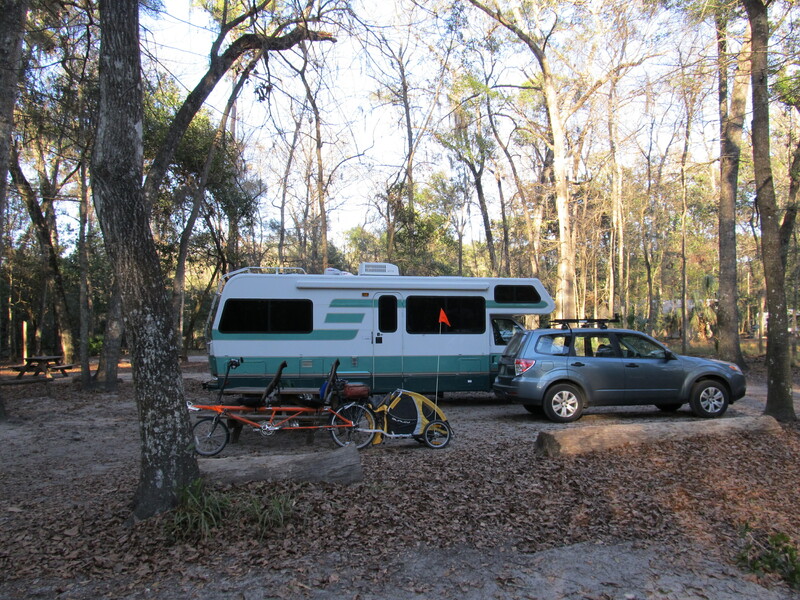 We stayed at Manatee Springs State Park so we could let SeeMore loose on the Nature Coast State Trail which runs from Chiefland Florida to Cross City (westerly) and/or Trenton (easterly). It really is a great big "T", which runs for 31 miles. No little drop in temperature was going to stop us! We started at our campsite and rode the 7 miles east on route 320 until the trail crossed the road, we then rode south until we reach the park (across rte 19). Sammie, the Rear Admiral, and I enjoyed our lunch while watching the town workers take town the holiday lights. After lunch we rode north for 8 miles until the trail "T"ed at Fanning Springs. The trail is paved and flat. We meet very few people on the trail (only one cyclist), probably because it was mid-week and cold (Florida cold). We are glad we rode this Rails-to-Trail but would not go out of our way to revisit. Manatee Springs State Park is famous for the winter home of the endangered Florida Manatee. The swim up the Suwanee River, and enjoy the warm spring feed spring that feeds into the Suwanee. 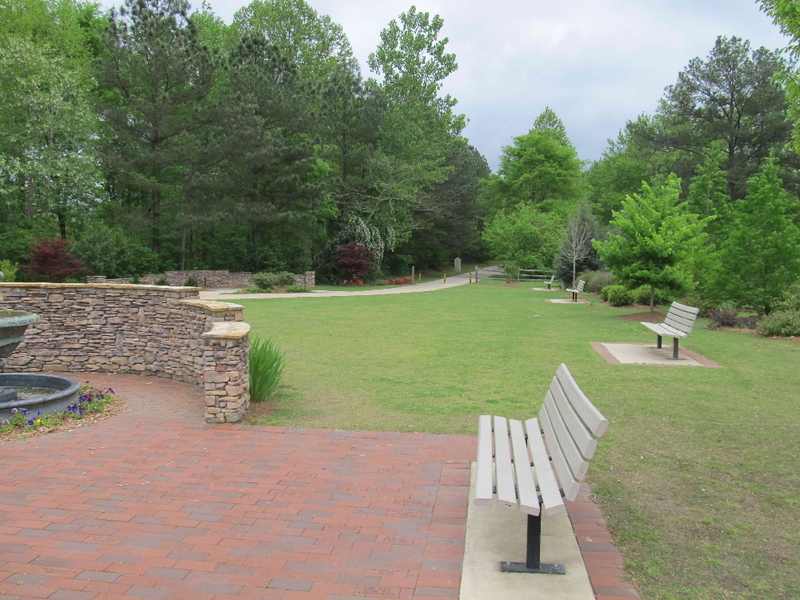 There is a very nice boardwalk which follows the spring and ends at the Suwanee River. While we were there, we saw no Manatees. People said the spring was too shallow and the weather was too cool for them to be in the spring. 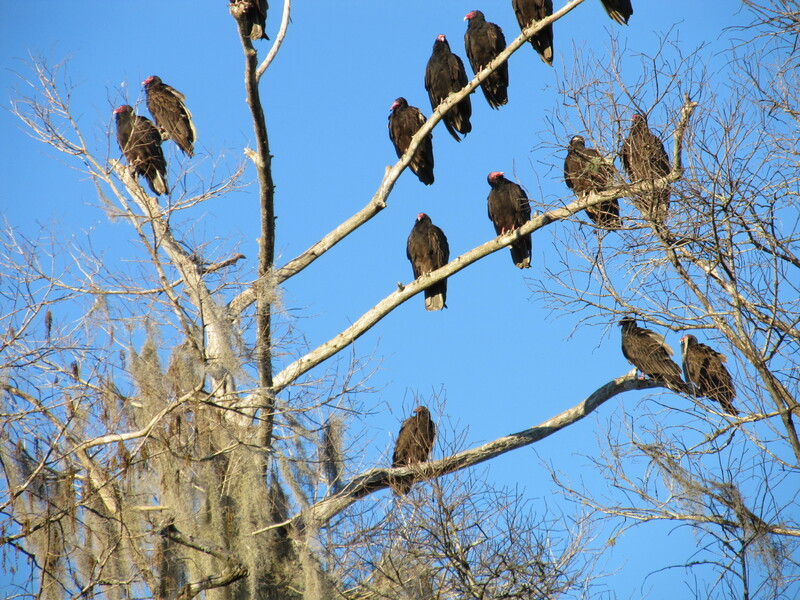 We did see hundreds of black headed vultures, which live here year round. They were in the trees that lined the spring, they were air, they were on the shores, basically, they were EVERYWHERE. Maybe the Park should be renamed, Vulture Springs State Park?.but it just doesn't have the same ring to it! The Lake Okeechobee Scenic Trail (LOST) is a 120-mile trail around " the Big Lake," as they call it (and it is big, about 730 square miles). The trail runs atop the Herbert Hoover Dike, which, along with a system of locks, is what keeps the Big Lake from spilling out across the vast flatlands of South Florida (which used to be flood plains or swamp before the U.S. Army Corps of Engineers came and altered the landscape). Sections of the LOST are paved, and other are packed gavel. We gained this knowledge from their website. 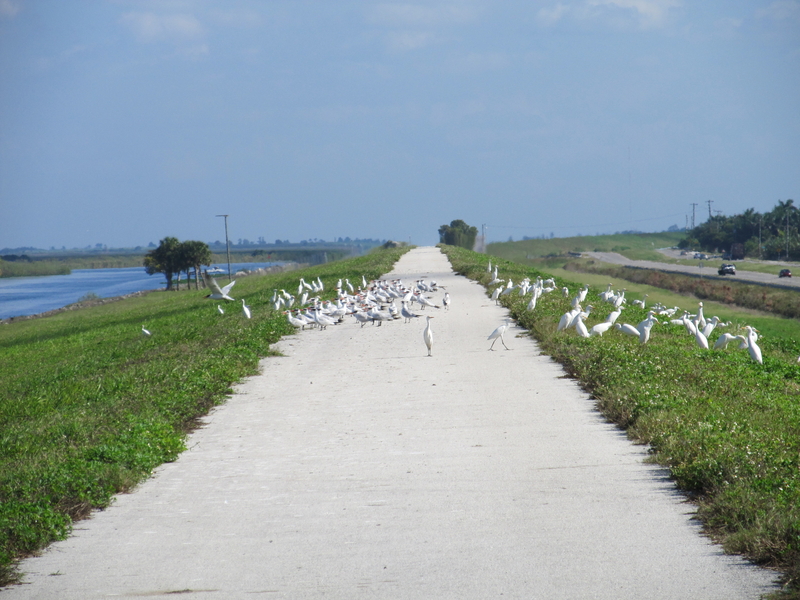 We wanted to start at the paved section in the town of Pahokee, then ride to Clewiston (and then return back to Pahokee) but there was major dike construction that closed the trail (going clockwise) until the Belle Glade Recreation Area. The best thing about riding atop the 34-foot tall levee was the view. Lake Okeechobee lay below us, and in some areas there was water on the other side of the dike. Both bodies of water provide great habitat for birds and other animals. Sometimes the huge birds (various wading birds and vultures) swooped by, spreading their broad wings at eye level. The view opposite the lake was filled with lots of sugar cane fields and semi busy route 27. We had a number of truckers honking and waving at us today, which reminded us of our touring days! We saw no other hiker, cyclist, or walker on the trail today, which made us want to scratch our heads. The worst thing about riding on the dike was that there was no place to hide, so all during today's ride we were at the mercy of the wind and the bright Florida sunshine, with nary a tree at our level to slow either down. Because the trail curved around the lake, there was no way to avoid headwinds at some point. When we turn back toward the car, the headwinds also turned with us. Another goal today (besides enjoying SeeMore's company) was to find the Army Corps of Engineering campground in Clewiston, Fl. We did not find the campground (even though it appeared on our campground app), but we located the AC headquarters in Clewiston. Mary went in side and had a very nice talk with the lady inside. After the day's ride, we visited another Corps site in Stuart Fl. 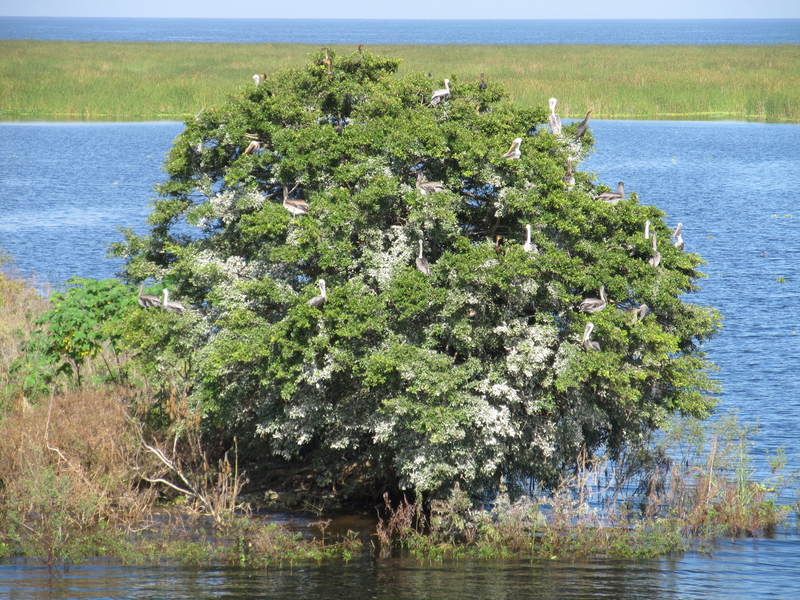 The small part of the Lake Okeechobee Scenic Trail that we rode was a very pleasant ride. The trail was wide, paved, and uncluttered with excellent visibility.We would highly recommend this ride to anyone visiting South Florida. With access to a number of motels, campgrounds and restaurants around the lake, a cyclist could get LOST for days. We also recommend the South Bay county park for camping! Just the opposite of the flat and straight James A. Van Fleet State Trail, the West Orange Trail winds through 22 miles of fields, forest canopies, neighborhoods and towns The West Orange Trail is a VERY popular rail-trail located just a few miles west of Orlando in Orange County, Florida. 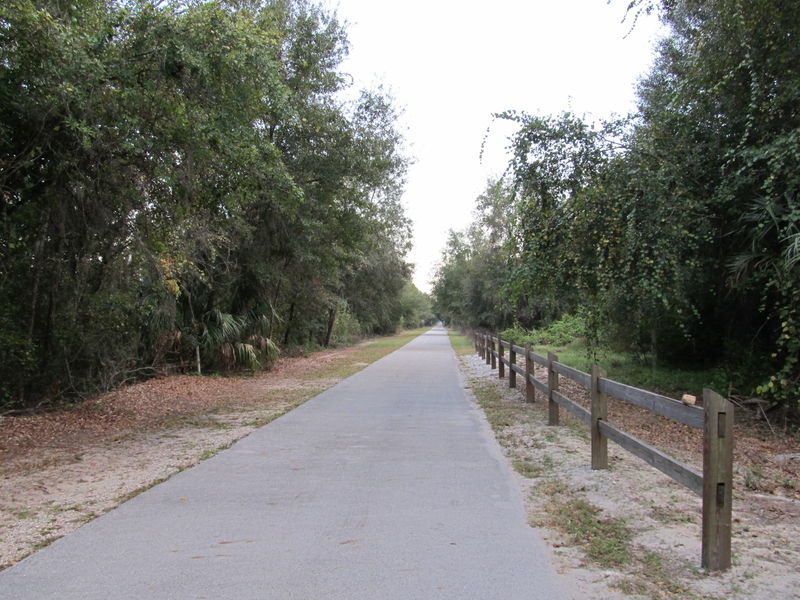 The trail runs along the borders of Lake Apopka on the abandoned right-of-way of the Orange Belt Railway and connects the communities of Oakland, Winter Garden, Ocoee and Apopka. SeeMore started at the west end of the trail in Oakland, at the Killarney Station. Besides the parking lot there are restrooms and a place to rent bicycles. There are also many other rest areas (Stations) along this trail. Since it was a Saturday, the parking lot was completely full except for one last spot which we were grateful. We have a feeling that this trail is popular any day of the week. This nicely paved trail is never straight, and crosses many roads which the rider needs to be fully aware of. 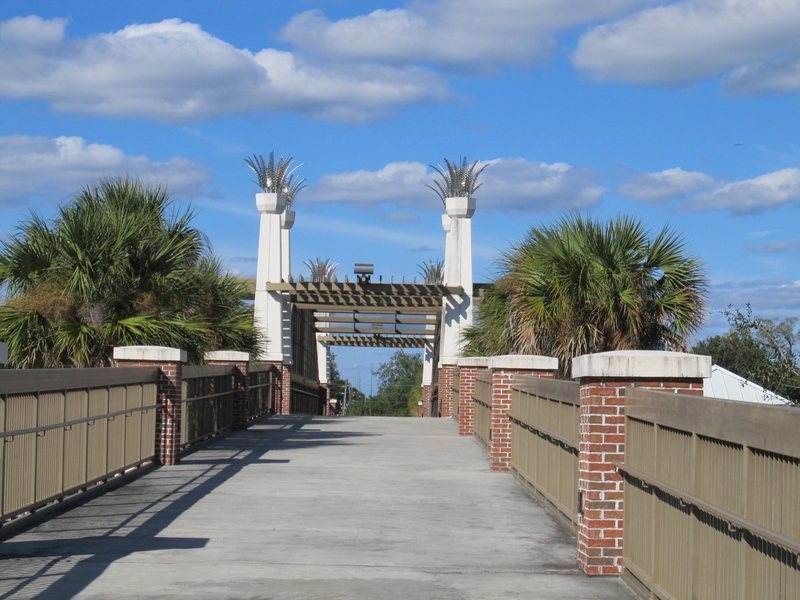 The paved trail allows you to travel down the very middle of downtown Winter Garden, the former center of citrus processing in the area, which is now a bedroom community for Orlando. From Chapin Station at mile seven until Ingram Outpost at around mile 12 the trail has a more rural feel, except for the bustling stretch that passes near the Forest Lake Golf Course in Ocoee. Cyclist are protected from missed hit golf balls by a 10 foot chain link fence with an 8 foot chain link fence extension. This fence is very well placed (there most be a lot of golfers who can hit the ball like me)! When the trail reaches Apopka, one of the less scenic parts of the trail, it becomes fully urban for the first time since it left downtown Winter Garden. You get to climb up and over "main street", then ride past the High School, into the busy section of Apopka. We decided not to do the last mile of the trail because the trail ran along a very busy and noisy street. 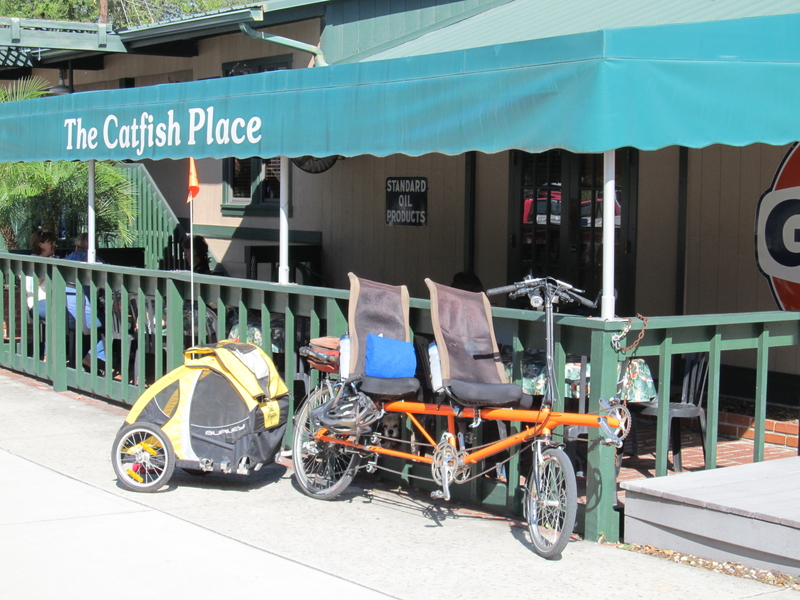 Lunch was at the Catfish Place in Apopka. We enjoyed the outside dinning area, and the chocolate volcano dessert (remember it's the eating, not the riding that is most important!). Afterwards, we rode back toward Oakland, and Killarney Station. We don't believe you could ever get bored riding this trail. The only drawback(s) were the many road crossings, and the very end of the trail (eastern side). SeeMore rode the James A. Van Fleet State Trail. This former railroad runs 29 miles through some of Florida's Green Swamp and can be summed up using just two words - flat and straight. No need to change gears, no need to use the brakes, no need to use your handle bars to steer. This is a straight, flat and nicely paved rails to trail. We started out in Mabel Florida at the northern terminal (121st street), and rode south to Polk City. Supposedly, among the wildlife, you will be able to see alligators in the water beside the trail and various snakes sunning themselves on the path. Fortnately we did not see this variety of wildlife as I did not mention this to the Rear Admiral! 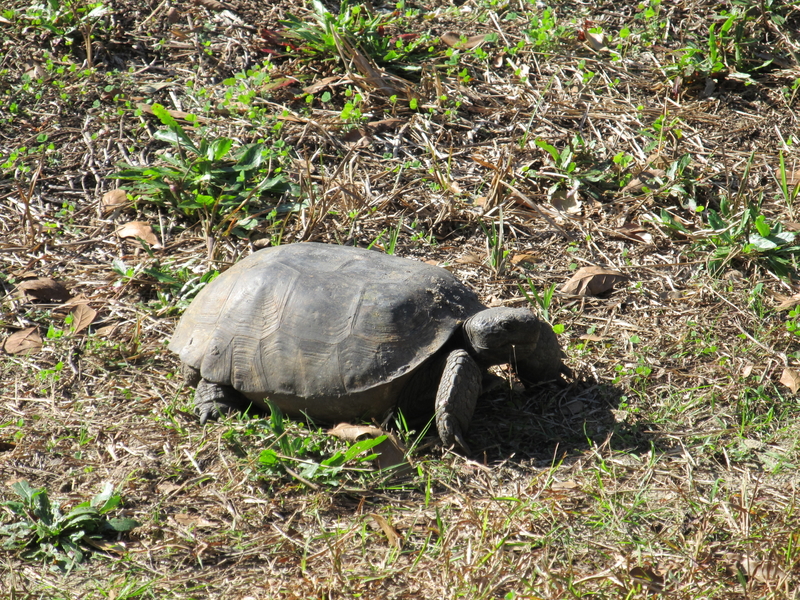 We did see many squirrels, gopher tortoises, and vultures but nothing else. The multitude of trees and plants kept our interest though. It is wonderful to see flowering trees and schrubs in November. There are flush toilets and drinking water at the both ends of the trail and one ten miles north of Polk City. We rode an extra 2 miles because the Rear Admiral had difficulty (first time) using the Urbanspoon app for our iPhone, locating our lunch. For lunch we had our first Hungry Howies. They are a franchise of pizza places, located from Michigan to Florida. We ordered the steak, mushroom and cheese "sub". When I went back to ask the gentlemen to not toast the bread, he looked at me like I had two heads. The "sub" was really a calzone (minus the pizza sauce). The jury is still out on Hungry Howies. Would be do this trail again? It's a great trail, best served in smaller portions. I would not recommend the 60 mile round trip. If your looking for a quick 20 to 30 mie trip there is enough diversity on the trail but after 40 miles we started to think we were in the twilight zone. Warning, if you are traveling route 58 in Virginia, from Damascus to Whitetop, we recommend unhooking your tow vehicle . . . if you are camping in a 5th wheel . . . good luck! For those of you are visiting the area in a RV your best bet for accessing this trail is to find camping or lodging in the Abington/Damascus area. Hind sight is 20/20 so unfortunately, we stayed the night at a private campground near the summit of Whitetop mountain, Virginia (elevation at the summit of Whitetop is 5, 525 ft). The campground was located in the middle of a Christmas Tree Farm and we were the only campers in the place. The RV sites are located on top of a hill full of Christmas Trees. The views and the smells were fantastic, but it was way over priced for what you got in return (no wifi, no cell, no running water, luke warm showers, and the bathrooms were located at the bottom of the campground). This is a nice campground for tent campers, not so much for RVs. After scoping out the area and a quick ride in the car down to Damascus, we decided to ride the trail up hill from Damascus to Whitetop. The elevation differences between Damascus and Whitetop is about 1600 feet over 17 miles. The steepest grade is 5%. Since SeeMore had not been out much all summer, we decided to challenge ourselves a bit. What a great decision. So in the morning, we packed up Gulliver (our Lazy Daze and with the Subaru leading), then headed down the mountain to Damascus. At the parking lot in Damascus Mary made breakfast (her lumberjack special without bacon). I got SeeMore assembled and attached Sammie's tail wagon. 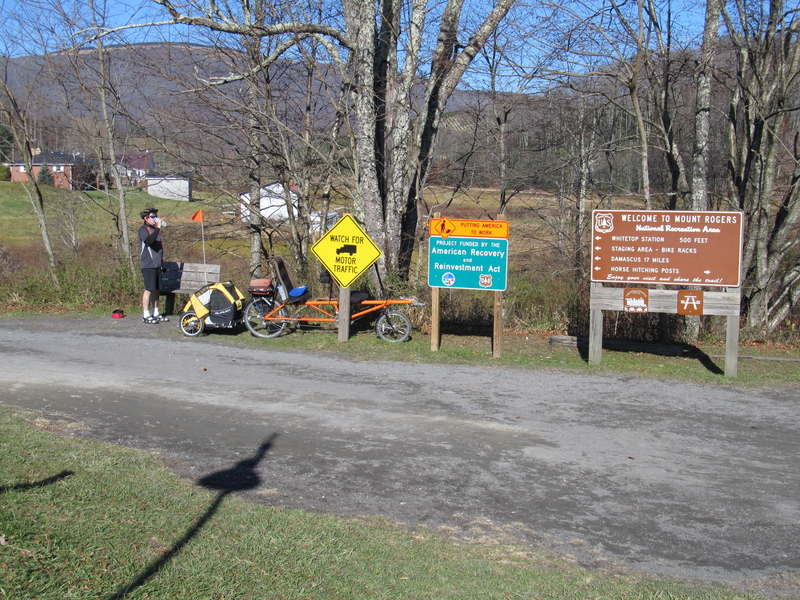 The Virginia Creeper Rails Trail travels for 34 miles total, from end to end. Starting in Abington, Va and ending at the North Carolina border. Damascus Virginia is the exact half way point in the trail. If you wish a less stepper climb, take the trail towards Abington. Damascus is also famous for those hiking the Appalachian Trail, part of the Appalachian Trail actually follows the Virginia Creeper Rail Trail . . . SeeMore has now done some of the Appalachian Trail! Riding this trail is like taking a hike in the mountains on your bike. 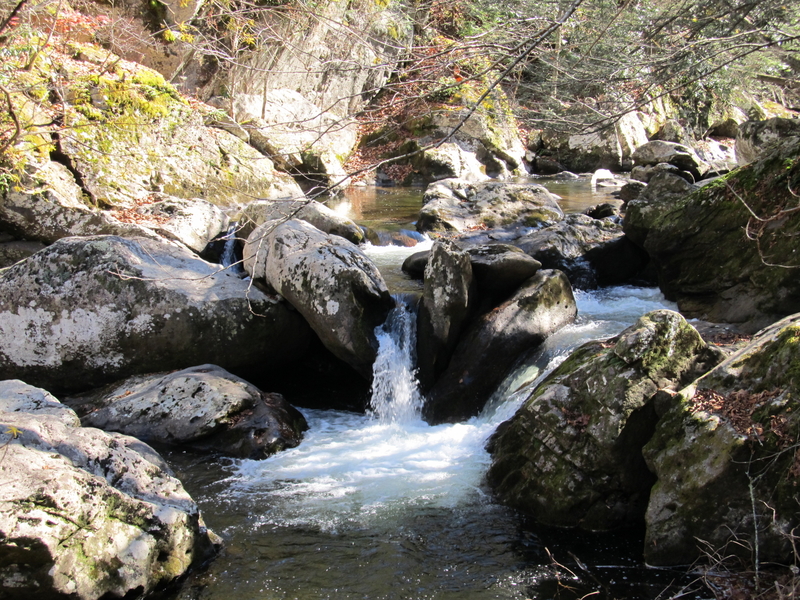 It is BEAUTIFUL, following the Whitetop Laurel River almost all of the time. If you seek views of wildlife, mountain laurel, birds, christmas tree farms, beautiful waterfalls, ride this treasure. The trail's wide graveled stone path crosses many bridges as it curves through the mountains. Along the trail are a number of rest room facilities, and there seems like there are plenty places to eat (during the busy months). You will pass hikers (some going up Mount Rogers, some enjoying the Appalachian Trail) and horse riders. There was very little bike traffic on the day we rode, due to off season. Although this trail is promoted as a mountail bike trail any bike with hybrid or non "street/road" specific tires will do well on the trail surfaces. There are (eye count) 5 bike rental companies in Damascus which allow you to not only rent bikes, but will take you to the Whitetop parking lot (or Abington), so you can have a very easy 17 mile ride back to Damascus. SeeMore would have none of that, being the thoroughbred that he is. The climb out of Damascus had grades from 2 percent to 5 percent . The steepest grades located towards the Whitetop end of the trail. It took our "out of shape bodies" about 3 hours to climb the 17 miles, and about an hour to go down. Of course, Sammie in the trailer didn't want to help pedal up hill! We had lunch at the Whitetop staging / parking lot. On our return journey back to Gulliver, we did not pedal for about the first 5 miles. We had to pick up our pace a bit near the Green Cove Station, as we were chased by what we previously had thought was a big "dead white sheep" which actually turned out to be a very large newfoundland dog. . . who gave SeeMore and a barking Sammie a chase! So if you in the area, make sure you get on your pedals and enjoy this Virginia Gem. A friend of ours recently had surgery on his right arm, and after a long healing process, he will then have his left shoulder worked on. With all of these "repairs" he will be pretty incapacitated for almost a whole year. He is very fit, and one of his activities is bicycling riding. This got me thinking about how a recumbent bike just might be the ticket for those of you out there who have otherwise had to give up riding due to physical demands of a wedgie style bike. If you are one of the many baby boomers who are considering cycling as a regular activity but are worried about how you can ride without putting stress on your backs, shoulders, wrists, or arms? My answer is ....how about giving recumbent bicycles a try! Before continuing, I need to confess. The number one reason why I ride, is that it is my "yoga". I am addicted to the circular movements of the pedals, it allows me to get into the "present". As an example: If I have a long day, filled with hard decisions, the best why I have found to solve them . . . is the go for a long bicycle ride AND keeping my mind as totally free of thoughts as possible. At the end of the ride, if I really stayed "present", those hard decisions are solved. So for me, getting on a bike, and pedaling a 10-30 miles is a joy. What I Know about Recumbents. SeeMore, our orange tandem, is a Rans Screamer. He is aptly named, because we truly believe we "see more" when we out enjoying his company. We also believe that we are "seen more" by other vehicles sharing the road. With this combination we feel very safe riding him. To date, we have only ridden two recumbent tandems. Tandem life is not all down hill, and tail winds. It takes two to ride, and there have been days (very very few) that it felt that we were both riding on different bikes. For more information on what it feels like riding SeeMore, click here. Is SeeMore perfect? Almost. The only thing I would change is the size of the front tire ( I would like each tire to be 26 ). Yes, for a couple of years now I have been looking at the Rans Seavo... but it ain't going to happen (we're too attached to Seemore). The reason for two 26" tires, is that on tours I would be able to only carry one size tube AND I could rotate the tires, making the tires last a lot longer. When SeeMore's rear tire blew 70 miles from West Yellowstone, I could not switched tires ( letting the rear one carry all the weight) thus I felt very uncomfortable trying to get into West Yellowstone on a "non touring " tire. Let's face it, you are an oddity when on the road. I am pretty "famous" cycling the roads in southern New Hampshire. People honk at me all the time, and people pull over and stop me to talk about recumbent cycling. This is one of the things you have to get use to. I truly love fielding questions and meeting people. If solitude is your goal, you might find it hard when riding a bent. I can't wear cycling shirts, the back pockets used for storing quick snacks rub against the back of my seat. This causes irritations. I don't need cycling pants, I mostly wear shorts (at temperatures above 50) but they must not have rear pockets (irritations, again). I find most of my "recumbent cycling wear" at stores like EMS. Also, I do not wear cycling gloves. Because there is very little (almost none) body weight on the handle bars, I found gloves unnecessary. No more funny tan lines on the back of my hands! I enjoy being clipped in. Which brings up an important fact. When coming to a stop, you must get to a gear that will allow you to start off easily. ALWAYS SHIFT DOWN when coming to a stop. You CAN NOT stand to push down on the pedals. At stop signs or caution areas you will need to be more respectful. When riding SeeMore, the rear admiral stays clipped in, while I put my left foot down, balancing everyone while stopped. During stops, with one leg balancing, my right pedal is at the "11:30" position, ready for the all clear. Both on the tandem and on my single recumbents, I've had to head back down a steep hill, before continuing to climb. . . when I was forced to stop mid ascent. Moral of the story, try not to stop on a steep hill! Things can get a little tricky here. It depends on the recumbent, but when shopping for one you should be aware on how accessories may or may not fit your chossen bike. Remember to consider how a mirror, lights, computer, water bottles, rack, or bags need to attached. 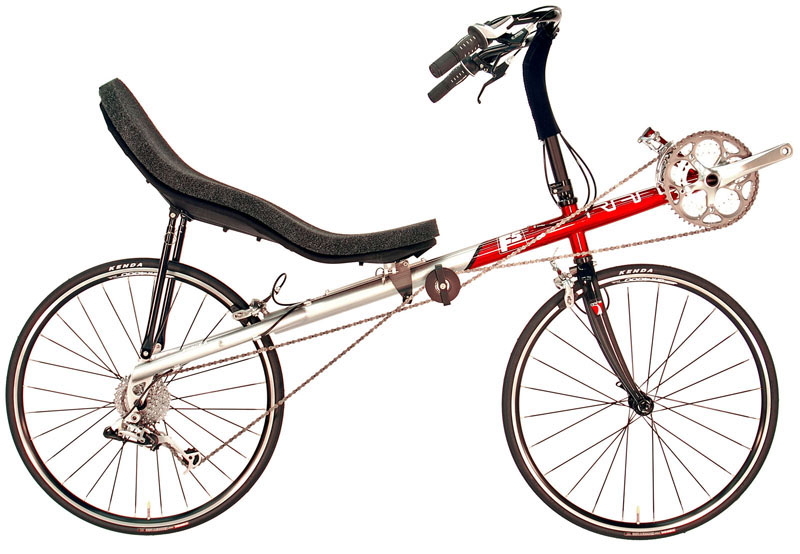 Some items need to purchased at a recumbent dealer, some need to be tailored to work. Brake and derailleur cables almost always have the be tandem length. Down Hill - we are faster than most regular bicycles going down hill. Flats - we can maintain the same speed as others of our ability on the flats when we are on our single bike(s). SeeMore is a beast...and he is slow (the way we like him to be!) We have a slight advantage on flats when riding into headwinds, then our friends on their regular bikes. So we tend use less energy. Climbing - Hills are a different story since we cannot stand on our pedals. While climbing, our lower back pushes against the lower part of the back of our seats. We can travel at a slower speed without feeling like we are tipping over. So yes, our recumbents are no speed demons going up hill. How about climbing large hills on a bent? Mary and I climbed 27 Mountain (Rockies) passes on SeeMore on our Great Parks tour. Steering and turning are different also. Recumbents need very little steering. This is something you will have to get used to. It is very important that your hands rest gently on the handlebars. You can over steer, which is a big mistake. Just remember that THE BENT is in control, and you are all set. Most of our steering is by shifting our weight. If you hit a groove in the pavement, do not steer out of it! It's best to let the recumbent handle it. It takes a full size two lane American road to reverse direction when we are on SeeMore. Our single bents take a lot of road also. When reversing direction, you may need to watch your heals of your feet, as they may hit the front tire of certain recumbents. I have ridden a number of different kinds of recumbents, but not all. If you are located in New England, the two bicycle shops I would recommend visiting are (in order):The Bicycle Man located in Alfred New York and Basically Bicycles located inTurner Falls MA. I have always wanted to visit the Bicycle Man, but as of this post I have not. However, I learned (through many blog postings on my different websites) that he really really knows his stuff. He has a larger inventory than most shops (even recumbent only shops), and if you tell him exactly what your trying to do, he will point you in the right direction. We purchased the Rans Rocket and SeeMore at Basically Bicycles in Turner Falls Ma. David (the owner) doesn't have a lot of different bents to ride, but he is very knowledgeable and he has a no pressure sales approach. He let Mary and I take SeeMore out for 2 days (about 70 miles) of test driving, before we purchased him! I get the feeling that he truly loves recumbents and gives you the opportunity to figure them out before you purchase (more on this later). The Rans F5 I own is fast, but not made for commuting. He is very light. With the wind fairing this is a very fast bike. Younger cyclists have a hard time keeping up with me (I'm 50 plus years young) when I have the need for speed. If you need more speed, I would recommend the F5 Pro over the regular F5. 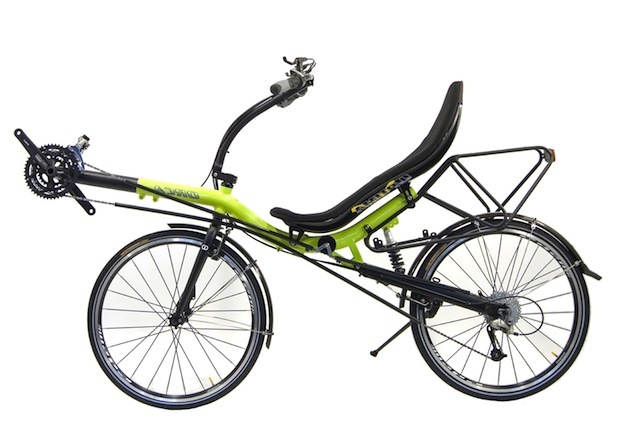 The Gold Rush by Easy Racers is another very fast recumbent. I ride a Optima Orca to commute back an forth to work. My commute is about 32 miles, round trip. This is a very "bullet" proof bike which allows me to carry a lot of "stuff". He is NO light weigth. We take the Orca, Rocket and Screamer off road on hard packed rails-to-trails. However, we do not do very well in soft sand, period. We also do not do mountain biking on our recumbents. If I lived in a area filed with bicycle trails I would own a Quest velomobile. I have never ridden in one but reading the many blog postings on the net I get the feeling that the Quest is, quite simply, a human powered rocket. The design of the Quest incorporates full suspension, drum brakes, front and rear lighting, trip computer and a kayak-style 'skirt" to protect the rider in cold or wet weather. Then I would be able to ride, comfortably, even in downpours! Most of you reading this are sitting with your backs against a comfortable chair. If you stop reading and look around, your vision is about 300 degrees in every direction. Seating on recumbents is the same. We refer to it as sitting in an easy chair. After day trip, riding for 50 miles on one of our recumbents, we do not have any upper body aches or saddle sores. Yes we get tired and we can definitely feel our leg muscles, but neither of us have knee issues. With regard to figuring out whether a recumbent is for you? You will need to have patience, you will not learn to ride a recumbent over night. The ride part is pure delight but getting going is challenging and you have to practice, practice, practice. The best advise on purchasing any bicycle, is to test drive as many as you can.